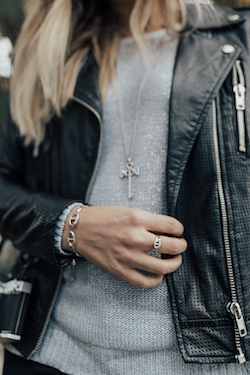 Newport Beach, CA—Gadbois Jewelry launched Charlize Gadbois, a sterling silver and diamond fashion collection, in June, expanding the brand’s depth in the industry. The brand is the brainchild of mother-daughter duo Frances and Charlotte Gadbois. 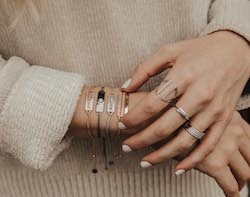 The Charlize Gadbois collection is comprised of dainty necklaces, weighty bracelets, statement earrings, and stackable rings, retailing from $60 to $700. It fuses fashion and fine jewelry with a modernized twist on classic Gadbois Jewelry silhouettes from the brand’s 18k gold collection, Sloane Street, and adds the brand’s signature texturing on most pieces. 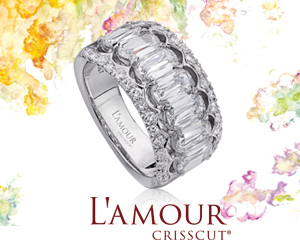 Each piece is handcrafted by the same team of jewelers responsible for the brand’s high jewelry collection, Sloane Street, and made of sterling silver with diamonds that are triple-sifted and inspected by a state-of-the-art De Beers diamond quality sorting machine. The collection is also available in 18k yellow and rose gold vermeil, achieved by using three microns of heavy gold coating over the sterling silver base. This heavy plating technique allows for more stable and long-lasting wearability, and all gold-plated jewelry comes with a lifetime guarantee. "Our goal for this collection was to build high quality product coupled with unique yet classic designs at an affordable cost, something we feel is missing in the marketplace today," said Charlotte Gadbois. 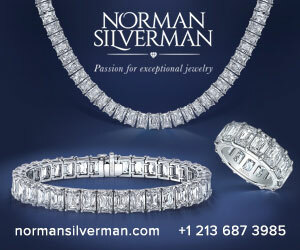 "Charlize is the epitome of the contemporary woman." Geneva, Switzerland—For the third year in a row, Rolex has garnered the number-one spot on the Reputation Institute’s RepTrak100 list of top global corporate reputations. As many companies can cringingly attest, corporate reputation is a fragile thing: bad behavior by one or multiple employees, a product recall, or misleading advertising can damage a company’s image for a thankfully short or embarrassingly long time. The Reputation Institute addresses these and other factors in compiling its list of consumer perception of multinational brands. Its most recent report—based on responses from more than 230,000 individuals in 15 countries during Q1 2018—puts Rolex at the top of the list, again. While a brand that thrives on elitism, conspicuous consumption, and exclusivity might not seem like a top contender for the most admired brand in the world, Rolex has forged emotional connections with its customers and is known for both philanthropy and commitment to the environment. Although Rolex has a lofty reputation, it comes in third as the most-desired brand in the hip-hop world. 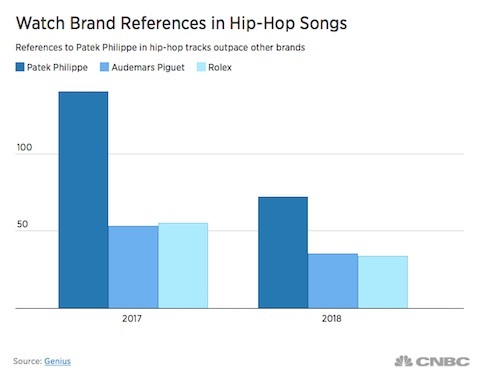 A survey of watch brand references in hip-hop songs suggests Patek Philippe and Audemars Piguet are both more highly desired than Rolex. Criteria for the rankings are product value and relevance, ethical behavior, transparency, the ability to make the world a better place, innovation, the work environment, and governance. The remainder of the top 10 brands are: Lego, Google, Canon, Walt Disney, Sony, Adidas, Bosch, BMW, and Microsoft. Separately, Patek Philippe is making significant inroads in challenging Rolex for its dominant position as the number-one luxury watch brand, reports CNBC.com. While Rolex still holds that distinction, Patek’s record-setting resale prices and rising influence among culture-setting celebrities and hip-hop artists might be giving Rolex a run for its money soon. As a result, it’s also gaining popularity in the cheap knock-off market. Read more here.